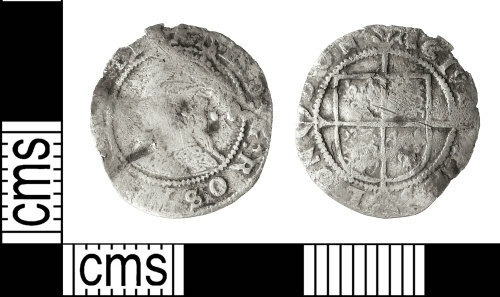 A worn and almost complete post-Medieval silver halfgroat of Elizabeth I (1558-1603), minted at London. Initial marks: no initial mark on obverse, key on reverse, 1595/6-1597/8 (North 1991: 137, ref: 2016). Obverse: E.D.G.ROSA [SINE SP]INA (A rose without thorns); Crowned bust facing left with two pellets (mark of value) behind the head. Reverse: CIVI/TAS/LON/DON; Square shield on long cross fourchée dividing the inscription. Diameter: 16.0mm. Weight: 0.68g. DA=12:11. North, J. J. 1991. English Hammered Coinage, Volume II, Edward I to Charles II, 1272-1662. Spink & Son, London.